UVPaqlite is a company that makes reusable glow products. They have glow sticks, dots, light weight Paqlites, and an assortment of other glowing items. 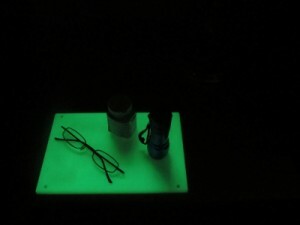 These products produce light kind of like a high powered glow in the dark sticker. They can be charged up with any light source and will glow throughout the night. I first tested some of their products last year and was really impressed with the quality and the amount of light they produced. They don’t produce enough light that you’d be reading a book by them, but definitely enough to be seen in the dark. And unlike regular glow sticks, these don’t get thrown away once they’ve been used one time. I have used UVPaqlite products on camping trips (they are especially handy for keeping kids happy when all the lights go out) and have some in my house to help mark paths at night. 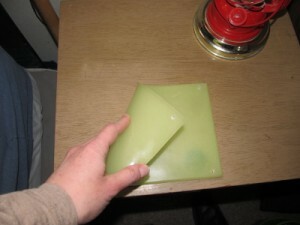 One of UVPaqlite’s newer products is called the UVMatLite. This mat is made of a flexible material that can roll and bend easily. The bottom is glossy and the top and sides are matte. It is somewhat grippy. Not slick. 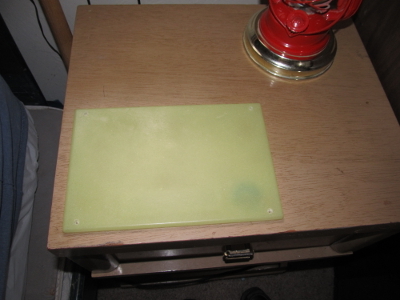 If placed on a hard surface like a glass table or even a nightstand it will stay put really well. The UVMatLite is approximately 9″x6″x1/4″ and comes with holes pre-drilled in each corner so you could easily hang it for lighting an area. I like it as a bedside light. Check out the pictures of how it works. Just so you know, the items on the UVMatLite in the photos are props. In most houses this would be a viable use for the UVMatlite. 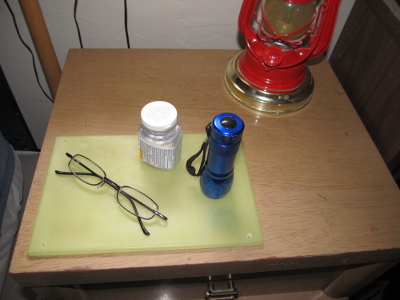 I, however, would not leave any of those items on my nightstand because I have a toddler who would destroy every one of them–especially the glasses. Anyway, the UVMatlite makes it easy to find what you need in the night without turning on the light. Maybe your glasses or medications or personal defense items. It also provides a little ambient light to the room. I am not really sure if I actually entered or not! How can I find out? Click the button to sign in on the rafflecopter box, then use the green buttons for each entry type. Once you’ve completed an entry, it will grey out that entry with a checkmark and say “done”. At the top right corner of the box it tells you how many entries you have earned.